Wait, is that word in the first panel Coal’s real name? Or is it something else, can’t quite grasp it from the context. It’s Coal’s last name, actually! He’s definitely surprised to hear it. Nice. I like where this is going. I think Torvaldson is his last name, meaning his dad’s name was Torvald. I think that guard recognized Cole. Regardless, the guard just saved that guy’s life. Sorry, I keep misspelling Coal’s name. Ah, the plot thickens! I love that the guard just tackles him like that. AND YES WE ARE EXCITED FOR CHRISTMAS! Placing my bet now: that random guard is Loki in disguise, showing up just in time to stop Coal from murdering someone’s face off. That would be a useful thing. …No, I’m betting that’s Loki. Jotun in disguise. Nobody suspects a thing. Octodaaaad- wait. Doh! KeL, I think you’re right. I was thinking, “Wait, who’s this guy?” Why ask a question like that when you *know* one of the regular cast is a shapeshifter. Octodad? Not sure I wanna know about that one. Octodad is only the most hilarious frustration/physics based game ever! You pretend to be a ‘normal human dad’. 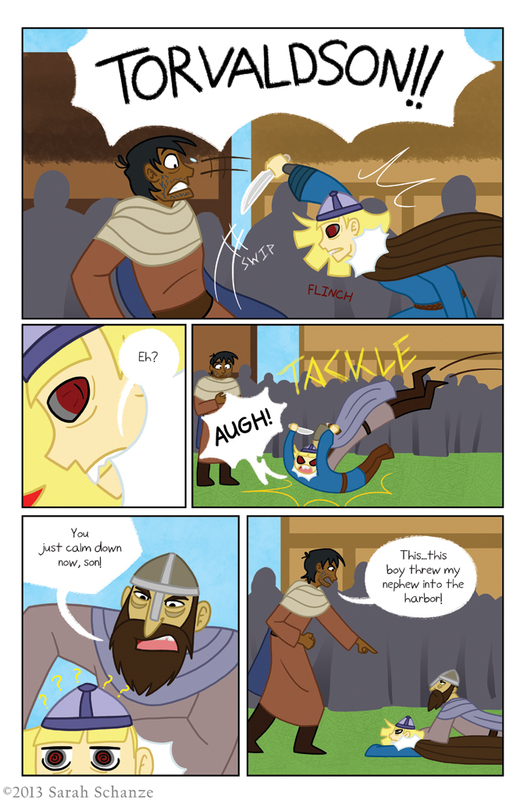 Coal’s face while getting tackled may be one of my favorite moments from this comic. I wouldn’t want you to throw in chibi moments all the time, but this one totally drains the tension. Perfect! Haha! Thanks. I try to use them sparingly but I definitely wanted something that said “drama time is over”. For now. Hm. I wonder if “Torvald” was a famous berserker? So that “Torvaldson” could be a generic reference for a berserker? Especially since the trait is apparently genetic in this world. Torvaldson would be Coal’s sir name. That is the way that names ran in the viking age. You were given a common name and then you were called by either your father’s name with son or daughter tacked on. Sometimes you were called by your mother’s name with son or daughter tacked on. Beserker simply translates out to Bear Coat, as the warriors who exhibited that trait commonly wore bear skins. They also had warriors who faught like that who where known for wearing wolf coats, but that was a bit less common. Yes, I’m aware of how surnames worked. There was simply no evidence that Torvaldson was Coal’s surname until Word of God confirmed it. I was not aware of the history behind the work “berserker” tho, thanks for that bit. As other people have mentioned, it’s actually Coal’s last name! This means that Coal’s dad’s name was Torvald. Fair enough…but was his father’s name mentioned earlier in the story? I don’t recall it being stated anywhere. If not, you’ve basically given out a spoiler here 😛 Before now there was no evidence Torvaldson was actually Coal’s surname. Which means that this person actually does know Coal. So he’s either Loki or someone from Coal’s past. I’m rooting for the latter, actually. It’s time someone cleaned up one of Loki’s messes and perhaps took him down a notch. No I haven’t mentioned Coal’s father’s name anywhere in the story till now. I don’t consider it a spoiler as much as another bit of Coal’s past revealed. It may not be the best way of doing so, but I’m still trying to figure out how to write. Sorry! No need to be sorry 😛 It’s your story, you get to tell it how you want. I was merely defending my conjecture pre-revelation. Took your sweet time, didn’t you, ya shape-shifting pain in the neck! It’s easy to lose track of people in the mall! It can be your Christmas present to us. I’ll TRY but I can’t make promises. Coal… flinched? Huh. Tackle doesn’t usually cause flinching, the guard must be holding a King’s Rock. Haha, “this boy threw my nephew into the harbor,” is just terrific. What a perfectly normal, everyday thing to say. It’s probably because he wasn’t expecting his surname to be called out! He flinched because he was surprised to hear his name called like that out of the blue. A little tackle like that definitely wouldn’t bother him! Also, I think the “guard” is Loki. He know’s Coal’s last name, and out of the group, I’m pretty sure he’s the only one who would be able to restrain Coal when he’s in a blood rage. Coal is a pro at making friend’s ain’t he? On another note – Cool! Tackling vikings! Just wanted to drop by and say Happy Christmas to Sarah and the TMK readers. 🙂 Hope you all are having a wonderful Christmas/Yule/New Year/Thorrablot/winter holiday!